Some questions about prickly people at work: Do you supervise someone you tip-toe around to avoid setting them off in some way? Do you sometimes feel that you and the rest of your workplace are held hostage by one person who is incredibly difficult for others to work with? Does it sometimes unnerve you? Aren’t you tired of it? The employee who must be treated like a time bomb: I’ve written before about discourtesy in the workplace. In fact, that is a recurring theme of mine, since I hear so many complaints about it. However, this article is focused on the person who is challenging because he or she is hyper-sensitive to critique or suggestion–let alone criticism. Perhaps the employee cries or sulks or becomes angry and withdrawn. The result is that coworkers and supervisors avoid the slightest hint of suggestion that something that person did or said should be done differently next time or could be improved. The difficult person becomes the only one who never hears a complaint or suggestion. No wonder he thinks he’s perfect! No wonder she is shocked at the slightest criticism! And, what often happens is that when a supervisor finally decides to say something he unloads on the employee in a way that makes things worse. The difference between sensitive and punitive. 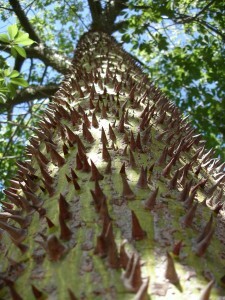 I chose the photo for this article for a reason: The prickly tree does not need to be treated gently because it is delicate. It must be treated gently because it will punish you otherwise! That is also why we need to have heightened awareness of employees who seem to be over-the-top about their emotions, irritations and reactions. You are not psychologist or psychiatrist, so you do not know whether the behavior is much more severe than it seems–not that psychologists or psychiatrists always know either! However, you are responsible for the safety and security of others, including the employee who seems to have trouble handling any critique. You are also responsible for enforcing rules and policies, and there are nearly always rules and policies about courtesy, respect and appropriate behavior. There are reasons to be concerned. Last week in Kentucky, an employee who had been chided about his repeated cell phone use and for repeatedly not wearing safety goggles, returned to the workplace and shot and killed five people, including the supervisor, before committing suicide. Many similar events have occurred in businesses, industry and government offices around the country. Supervisors and managers are justified in being concerned about prickly people! You probably will not have such a dire situation with your challenging employee, but I doubt that supervisor thought so either. You may think you know your challenging employee very well–you may even be friends. But, emotions and mental upset can result in actions you never expected. You certainly might have to deal with a lot of anger and bitterness. Do your job and handle the situation. Do not let yourself get into the habit of allowing poor work or ineffective behavior because you want to avoid the upset that will result if you say something. Do not require other employees to tolerate bad behavior from a coworker because you do not want to deal with it. Talk to HR, your psychological resources if available, and your managers, to let them know what you have planned. Follow organizational guidelines. For example, you may not be able to tell an employee it is his last warning if there was no first warning. You also need to find out what you can do if the employee reacts in a way that is a rules violation or becomes out of control. Can you place a formal disciplinary action about it? Can you require him to go to psychologist? Can you call security? Can you make him go home? Can you keep him out if he tries to return? Know in advance, even if you do not expect any strong reaction. When you talk to the employee, do your best to make it a comfortable conversation. That might sound impossible, but make the effort. Do not put desk space between you. Sit at a table or in a conversational arrangement. *Start by saying what you have observed, why it is a problem and what the employee must do differently in the future. Stick to observable behaviors, not what you think the employee thinks or feels. *Remind the employee of rules or policies and say they will be enforced in the future. *Keep it brief and do not preach or do excessive counseling, simply state the behavior that must stop. *Consider following that with the approach of reinforcing what you want to see stay the same, then getting the employee to say back what he or she will do differently in the future about a sample situation. *If you have organizational resources to recommend, provide those in a supportive way. Just do not let his problems become yours to solve. There are many resources that can provide more lengthy information about handling difficult corrective interviews than I have space for in this article. However, you will do just fine if you stick with that formula of stating the behavior that is a problem, giving an example, and getting feedback about how it will be handled differently in the future. I’m not saying the employee will like it or thank you. But, at least you can get through it. Get back to work. After the interview, quickly, quickly, quickly reestablish normal conversations and relationships. Assign work, thank him for a good job, be low-key but appropriate. Give him a chance to save face and move forward. I have experienced several supervisory situations in my career where I halfway expected a very angry outburst or a sulky temper tantrum. I was correct in three cases. VERY correct in one case! In another case, the employee looked at me for a moment and said, “OK.” He never acted the same tyrannical, angry way again! If I had known it was going to be that easy, I would have talked to him much sooner! Your situation will be unique and you must decide how it should be handled. However, do not feel foolish for thinking you have reasons to be concerned about someone’s hyper-reactions to criticism. There is ample evidence than such reactions can lead to more serious problems if they are allowed to continue. Good advice. And don’t forget to document everything, because these people seem to love to file grievances. What gets me is that no matter how mean they were, they will have friends who will testify that the supervisor was unfair, and suddenly the employees who were complaining start wishy-washying about their complaints. Still, it’s worth it to stop the bad behavior. Thanks for the comment Phyllis! You do a great job, and are well respected for it. T.
I’ve been accused of being a pain in the backside so I will point out that sometimes employees get sick and tired of putting up with things at work. I don’t excuse getting violent, I’m just saying that sometimes anger is because no one listens any other way. Yes, Wiseacre, I understand what you mean. I was focusing more on those who unreasonably react to criticism. However, I should have mentioned something about general frustration and anger. For example, the Con-Agra shootings a couple of years ago, apparently followed months of an employee being hazed and ridiculed. That doesn’t excuse what the employee did, but does remind us to not ignore bad situations we see at work. Thanks, as always, for your comments! T.
This is a request for you to write something about employees who aren’t violent or very angry, but who react to everything as though you are treating them unfairly, or as though you are wrong to say anything at all. I believe I do as much as any manager could do to be supportive of employees, but sometimes correction is needed and I have to remind people about work rules or the best way to do something. With this one employee I end up feeling as though I over-reacted and I feel in the wrong, even though my brain says I was correct! I think a lot of managers are in that situation and maybe you could suggest some responses. Thanks! Thank you for your comment, JW. Your situation DOES reflect the feelings of a lot of managers and supervisors. It’s part of growing up in an era where we are sometimes more concerned about empowering employees than (dirty word next) controlling their behavior at work! I’ll write something about that. In the meantime, I’ve sent you an email with some thoughts. Let me know if they were helpful. T.